You know it’s a good day when you see dolphins! Sitting on a bench….saying Om’s….looking out at the confluence of the river and ocean at Miramar Beach….the same view we look at from our room at the Goa Marriott….suddenly the polished blue-black marble skin arcs over a wave….three of Neptune’s fabulous creatures frolicking their way upriver. I hurry back to the room to share my sighting with Scott. And to share the delicious dark chocolate cookies Chef Samantha made for us this morning. 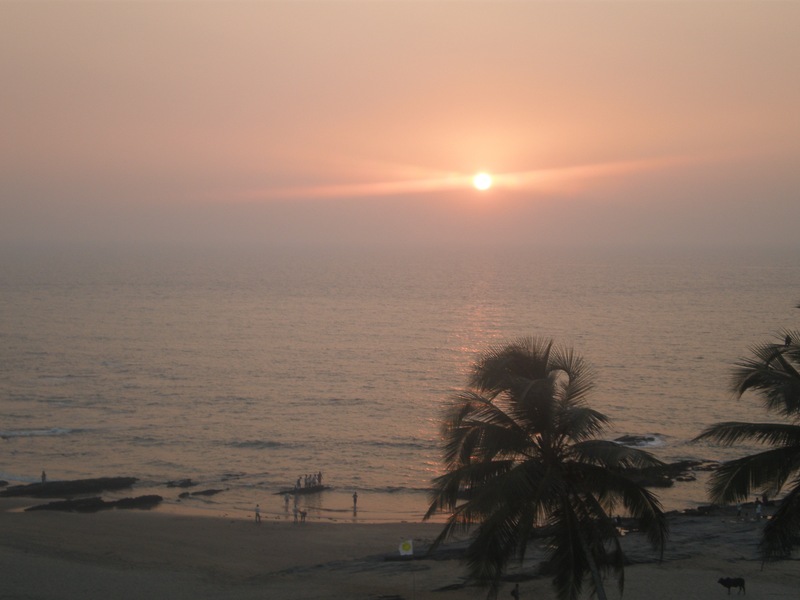 Speaking of sharing, this spectacular sunset was one we shared with friends Ritu and Sanjiv several weeks ago at Thalassa in Vagator. Good times. This entry was posted in Uncategorized and tagged dolphins, Going to Goa Blog, Scott Morgan, thalassa, vagator. Bookmark the permalink. such a beautiful place !! !